Set in 1976, real life Coach Jones befriends mentally disabled black student, Radio. They then form a friendship and bond over the football season. Though things take a turn for the worst when certain fans and parents feel that Radio is a distraction, and is getting in the way of the team succeeding. Linda: It's never a mistake to care for someone. That's *always* a good thing! Can a mentally challenged black youth be a catalyst to unite people in a South Carolina town? The answer appears to be that in spite of his handicap, James Kennedy, understood much more than what he was given credit for and went to become a fixture in the sports scene. Also, the film is saying how many of us overlook people with problems that can be helped if only we have the patience Coach Jones showed to the young man because of his own guilt in his heart. "Radio", directed by Michael Tolllin, is a formula film inspired on a true story. Yet, the movie is not a complete failure because of the inspired performances the director was able to get from his wonderful cast. 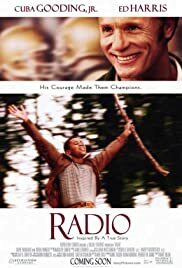 Coach Jones is instrumental in getting the young man, who is called Radio because his passion for collecting them, involved in sports, a passion he discovers in this retarded man who has had only hard knocks in his young life. Coming from a poor background, Radio, lives with his mother who is protective of him and questions the coach's intentions. Radio is seen by the school kids as a mascot, at first, then, his sunny disposition wins him the acceptance of everyone because he is a good person without an ounce of malice in his body. The film owes a lot to Ed Harris and Cuba Gooding Jr. who make a great pair as the coach and Radio. Mr. Harris, one of the best actors of our times is never boring in anything he graces with his presence. He gets the essence of the principled coach who sees the possibility to make amends for something that bothers him from his past. 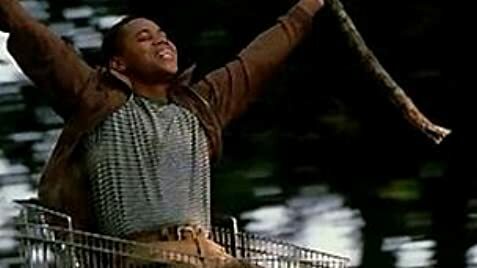 Cuba Gooding Jr. is also at his best portraying the mentally challenged young man. The supporting cast is excellent. S. Ephata Merkerson, one of the best actresses of her generation, does interesting work as the mother of Radio. Alfre Woodard, another good actress plays the high school principle with style. Debra Winger, only has a few scenes in the film. "Radio", while being sentimental, will warm anyone's heart because it shows how we tend to see some people are in our society that we know nothing about and how quick we are to judge them. Michael Tollin puts a lot of ideas in the proper perspective for us.